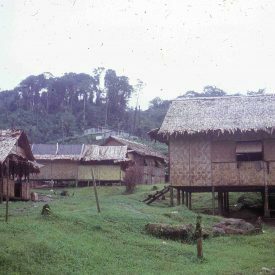 In a remote village surrounded by lush vegetation and rolling hills, a sparsely lit building perches on a small hill, isolated from the huts nearby. Raised above the soil on short stilts, the dank barrack held a sense of foreboding, as if something terrible had taken place within its walls—or was about to. No children’s laughter filled the tiny village that thrived with its fishing industry just days before. A hush hung in the air that stifled one’s senses. Twelve men lay motionless on their beds in the makeshift barrack. Charles Manning stood in the doorway in disbelief as the stench closed his nostrils. But it wasn’t death he smelled. In this corner of the world, no electric current illuminates the darkness of night. Standing water in a barrel used for drinking is lined with moss on the rim where a metal ladle hangs.